Dimensions: 3-Oven 1,000mm wide, 5 oven 1,485mm wide, 910mm high and 710mm deep. The 3-oven models have two generous sized hotplates and three spacious ovens (typically about 20% larger than an Aga range cooker**). We always recommend a nearby electric or gas hob with the 3 oven, for summer use and bringing to the boiler large amounts of water. The 5-oven models comes with a 2 ring halogen hob, and as an optional extra the 2 extra ovens can be full electric fan oven and the top oven has a grill. I have added a 2 Kw fan element in the top oven with a grill at the top and a 1.8 Kw fan element in the bottom oven so they are controllable for summer use if required. See picture of hob layout. Any of the above can be converted to run on Diesel/Gas oil/Gazole (France) for extra £285 including VAT. We supply technical support the whole way through and talk to your plumber or oil technician, fitters, electricians and chimney lining technicians, but we do not supply, install or connect the oil line. *Subject to conditions. Please email for further details (include mainland England delivery, no flights of stairs & regular servicing by a qualified technician). 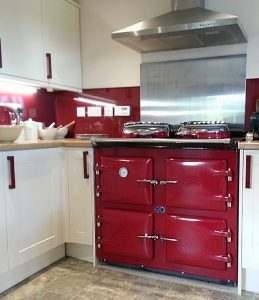 Oil-Fired 3-Oven Range Cooker: 1,000mm wide, 900mm high and 710mm deep. 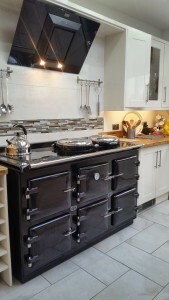 Oil-Fired 5-Oven Range Cooker: 1,485mm wide, 900mm high and 710mm deep.